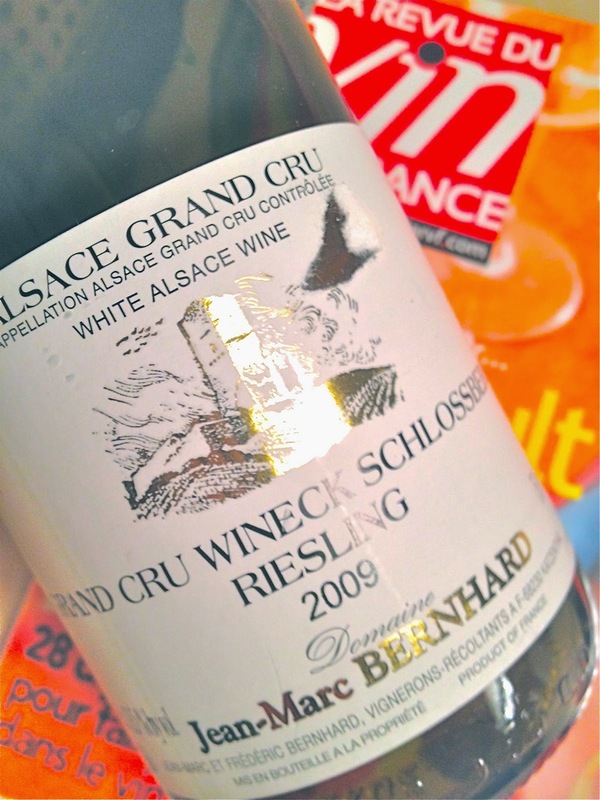 All vintages of Alsace are very different. The reason for the variations are obviously the weather, but mainly that quality producers do not manipulate their wines. If you harvest early, use standardized yeast, adjust the wine with acid or base, and use lots of sulfur the wines come out alike - and equally boring - year after year. 2009 vintage yielded wines that initially lacked elegance and had some bitterness. After 5 years, they have "come home" and finally developed a fine balance, even if the style will never be classic. But good. 2009 Riesling Grand Cru Schlossberg from Jean-Marc et Frédéric Bernhard in Katzenthal has a golden color. The aroma is rich and saturated with coffee, arrack, orange, ripe pineapple and peach puree. The palate is medium-bodied, powerful, somewhat hot and rich with sandy roughness, good acidity and very good balance. A wine with a substantial volume that manages to maintain its' equilibrium. Price: € 13. Inspired by your post I popped a bottle of one of my personal favourites. Mader’s 2009 Riesling Rosacker will accompany Saturday’s lunch. It opens up immediately with ripe grilled lemons and lovely developed petroleum. It’s obviously not sweet but incredibly rich. The fresh acidity does manage the almost fleshy body (14% alc.) and the balance is impeccable. I never had such a full throttle vintage of this wine before. It’s almost more Pfalz than Alsace by style. Comparing with other reasonably recent hot vintages, 2003 was a totally different story. It seems many grapes, despite the heat and because of the drought in 2003, never reached the maturity of 2009.